To reduce our impact on the environment. To ensure that our office maintains the highest level of sterilization possible. To make our patients as comfortable and relaxed as possible, making their experience as convenient as we can. Here are some of the ways we use technology to achieve those goals. Paperless office—Patients have literally one sheet of paper to sign. That’s it. All other forms are electronic. Digital and PSP Films—Using these technologies not only eliminates chemical waste, it exposes patients to less radiation and speeds up processing times for X-rays. LED Lighting—Govani Dental in the process of converting the entire Oshkosh office over to LED lighting to reduce energy usage. Sterilization is to the highest standard—Our staff goes beyond the benchmarks established by the Center for Disease Control (CDC) and the Occupational Safety and Health Agency (OSHA). Autoclave steam sterilization—All instruments are sanitized after every use, protecting your health. Disposable items—We use single-use, disposable items whenever possible to ensure a clean experience. Even the bib clips are disposed of after every patient visit. Protective safety glasses and masks—All staff wears protective safety glasses and masks during dental procedures. Disposable gloves—We use new, disposable gloves for every treatment. Clean environment—All surfaces that come into contact with patients are thoroughly disinfected after each visit. Continuous improvements—All staff is highly trained in sterilization techniques and participate in continuing education to ensure our sterilization practices remain at the forefront of the industry. HIPPA compliance—Email correspondence that contains any sensitive medical information is encrypted before it’s sent. Patient data is securely backed up on remote offsite servers to ensure security and disaster recovery. 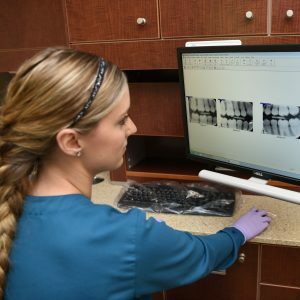 Digital radiography—X-rays are completed faster and with less radiation. Sunglasses— Sunglasses are required to shield patients from bright lights used during dental procedures. Leather and massage chairs—Available in the operatory. Wi-Fi—Internet access is available throughout the office. Nintendo Wii®, arcade games and pool—We know going to the dentist can make patients uneasy. All ages are welcome to relax and unwind before and after their appointment with games available in the waiting room.